Sydney will have a second harbour rail crossing by 2024 now that Parliament has given the green light to leasing public electricity assets, the New South Wales Government has said. Legislation to partially lease the state's power network was passed by Parliament last night. The new harbour crossing is the centrepiece of the $20 billion infrastructure package the Government promised to build using the proceeds from the sale. It will form part of what will be called the "Sydney Metro" — a new 30-kilometre high-capacity rail line from Bankstown through the city, which will connect to the north-west rail link via twin tunnels under the harbour. Premier Mike Baird said there had been talk about a second harbour rail crossing for 20 years. "The reason it didn't progress is quite simple: the funding wasn't there," he said. "Well, what we secured last night is a green light for that funding so that the project is well and truly underway." Transport Minister Andrew Constance said tunnel boring machines would be in the ground by 2017 and the project should be complete by 2024 at the latest. "We want to get this done as quickly as possible," Mr Constance said. "We are going to be engaging international experts to ensure that this is a project delivered at rocket speed. "We are going to see, I think, a revolution in terms of public transport. This is the game changer." 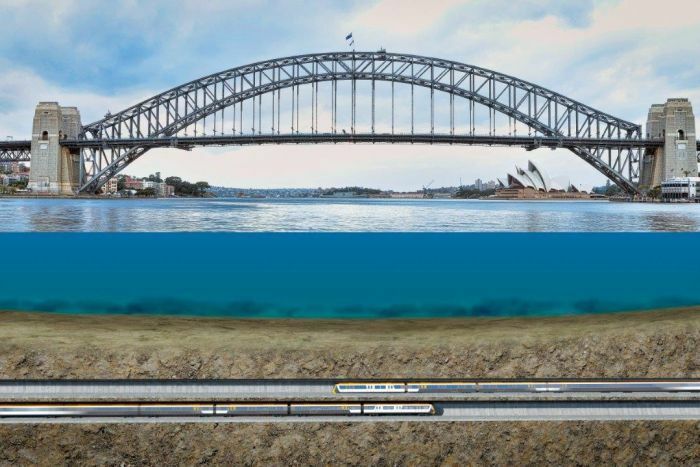 I have no idea what would be involved, but has anybody ever looked seriously at reactivating and extending the second rail track pair on the Sydney Harbour Bridge? I know the rail viaduct north of Milson's Point was demolished 50 years ago, and the track pair only ever extended as far south as Wynyard, but surely there would not be insurmountable problems in extending from Wynyard through to Central or some other place, and to the north there must be enough space in the freeway reserve to get the tracks off the bridge again. Not saying that a harbour rail tunnel isn't necessary, but what is the reason that the existing second crossing has never been used? Trams moved in, and when they went was given over to cars etc. Why no trains on the other side of the bridge. It's designed to handle trains. I think with the way things have developed it is not a realistic option. If and when documentation for the rail tunnel becomes available I am sure that will be detailed. The issue is not so much the bridge but either end (especially the city end where I understand there are plenty of basements in the way). Even back in the day Wynyard was still the terminus. New alignment fixes the problem and also allows for a stop at Barangaroo. I figure the basements are the thing, and underpinning them would be a hell of a job. But if I understand correctly, this only becomes a problem south of Wynyard, as the tunnels between the Bridge and Wynyard are still in place (albeit rented out to commercial carpark operators). My post is more along the lines of asking what would actually be involved in extending those existing tunnels past Wynyard? Perhaps the existing tunnels and platforms 1&2 could be deepened so that an extension would be deep enough to pass under nearby buildings? Or is the concourse/lower level in the way? Whatever way, when the govt is prepared to spend $20b on extra train paths across the harbour, surely with that kind of money you could solve a lot of problems with the reactivating the existing infrastructure. Fair point hUON. I would hope that utilising the case for using the existing infrastructure as been tested thoroughly. I would like to see actual detailed reasons for not doing to that. It must be some where. If anyone finds anything relevant please post. As we know the robustness of various mega-projects is sometimes rather dubious. It all depends on what the government is actually trying to achieve of course. Note that one of the alternatives to CRR was to create 2 track pairs through South Bank, duplicate the Merivale and run a new track pair adjacent to the existing 2 through the city. Cost was $4bn or less, but the CBR was significantly less than CRR. Interesting ... not much detail but appears a business case is developed or is being done .. Fingers in the pie of a lot of other interesting projects as well ... see right of the page above ..